By Richard Ross I can hardly contain myself as we park by the dock in front of the famous Monterey Bay Aquarium Research Institute (MBARI) in Moss Landing California. As we unpack our gear for the cruise it is dark and cold, the sun is still asleep, and I am literally jumping up and down with excitement. I try to get myself under control as colleagues from the Monterey Bay Aquarium start arriving until I notice that they are also overflowing with excitement. The science staff arrives, and they are equally excited. 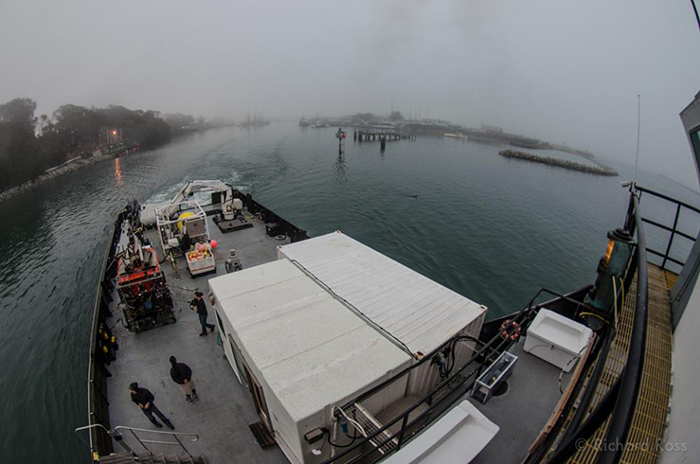 We are all giddy with anticipation as we board the 135 foot research vessel, Rachel Carson, the support ship for the Remotely Operated Vehicle (ROV) Ventana. Why are we all so excited? Today is the last cruise of the year for the ROV collection of deep water cephalopods for both public display and research; the forecast is for calm seas and our quarry is the Flapjack octopus (Opisthotheusis sp). The adorable Flapjack octopus just prior to being transferred to a transport bag. Photo by Rich Ross. I don’t get seasick. Ever. Even in terrible conditions. When I was 14 going out trawling with the local college marine bio classes in LA, we used to pack food that would make other people on the boat a little grumpy – my favorite was peanut butter and pickle sandwiches, which are delicious, but not to queasy people. Just mentioning them made people unhappy, so as to not be total jerks, we would go to the top deck, hold onto the rail so we wouldn’t be lost at sea, enjoy the rolling of the waves and eat up. Thanks to my wife who has dealt with motion sickness all her life, I have grown much more compassionate to people who get sea sick, but never got a glimpse of what they might actually be feeling until that my first trip on the Rachel Carson a few years ago. Counting the million screens in the control room. Photo by Rich Ross. On that last cruise, the seas were anything but calm. I didn’t get full on sea sick, but just a taste of that awful mind body goofiness, and it wasn’t the big seas that did me in. In the bowels of the ship is a little, dark, control room with several ROV pilot chairs, several science stations, and some space for observers to stand. The front of the control room is covered by a million (really, I counted) screens which receive information and send control signals to the ROV through a tether that connects the submersible to the ship. Some screens in the control room show data (depth, water parameters, ROV status, video capture, etc. 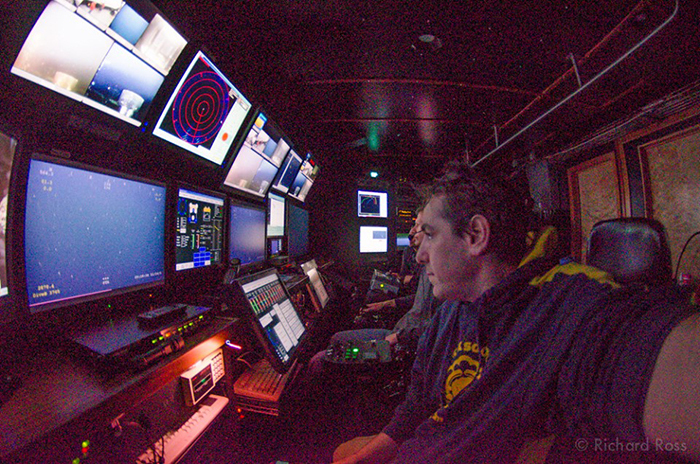 ), but most of them show different views from the multitude of cameras pointing different directions on the ROV. All these active video feeds of different views combined with the rocking ship got to me. What made it worse was that we didn’t see much that trip…mostly marine snow, in all different directions on the million screens…nothing to distract from feeling ill. However, this cruise is different; The sea is flat, and chock full of octopuses. But I get ahead of myself. Leaving Moss Landing in the fog. Photo by Rich Ross. After an efficient and useful briefing – wear life vest on the deck at all times, eat anything in the fantastically stocked kitchen, if you get sick go outside – we cast off and head out to sea. Thanks to a diatom bloom in the area, the sea is amazingly maroon colored, and we pass the short time to the work site by talking shop (cephalopod nerds are just the best) and enjoying the sunrise. 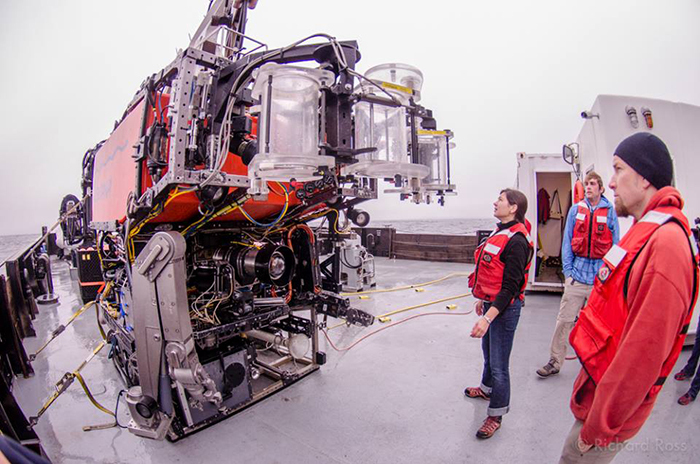 The ship slows down, and the deck crew jumps into action to deploy the ROV Ventana. MBARI science crew and MBA aquarists making sure collection containers are set and ready to go on the ROV Ventana. Photo by Rich Ross. While the pilots go through the NASA-like pre-dive checks on the ROV, the science and aquarium crew prepare the devices needed for the live healthy capture of deep sea animals and samples. There are a few ways to collect animals with this ROV. There is an array of static acrylic tubes open at both ends that are held on an armature for collecting specimens in the water column, By moving the ROV itself, through amazing piloting skills, the specimen is positioned in the tube which is then closed top and bottom. There is a suction hose that is connected to a carousel of specimen containers that is used to collect both animals in the water column and on the substrate. There is also a big drawer that opens and closes for collecting specimens that won’t try to swim away like rocks, mud, or corals. There is a manipulator arm with a grabber on the end to, well, grab stuff. There is also another arm that holds a supersized spatula that looks like a racquetball racket with plastic mesh as the strings that is used to pick up small rocks and mud. 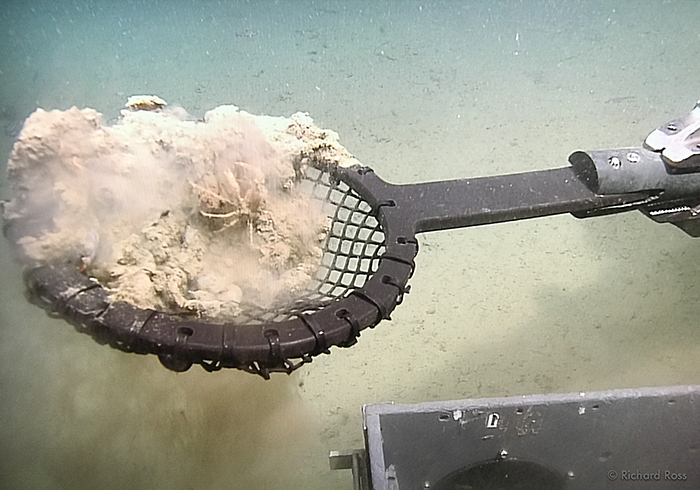 This spatula is also used to move animals from the substrate into the water column for collection. Today we are going to be using all three methods to collect octopus, mud and rocks, and some jellies. 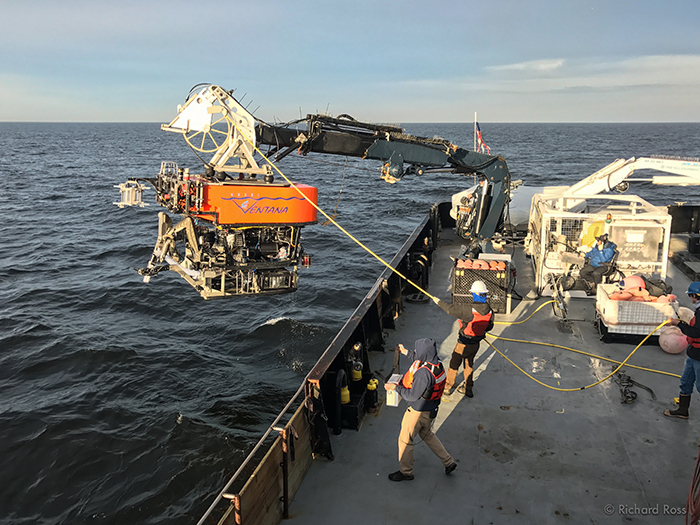 The deck crew launching the ROV Ventana. Photo by Rich Ross. 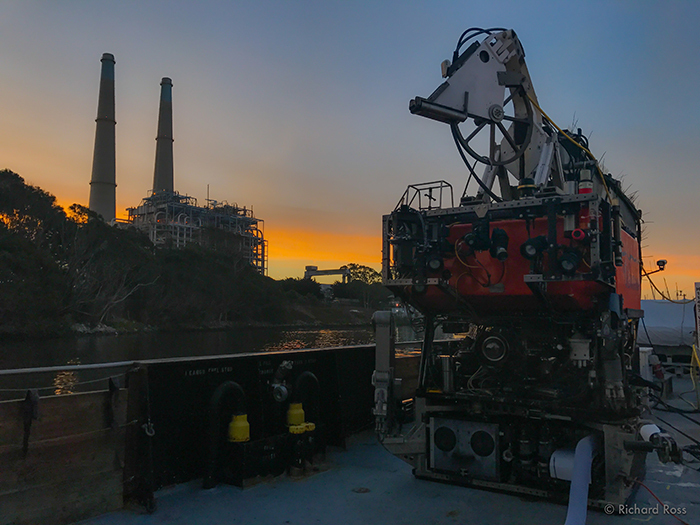 As the predive checks end, and we finish up prepping the wet lab to deal with the animals we hope to collect, the deck crew begins to launch the ROV. The crane on deck lifts the Ventana into the air in what looks like a precarious maneuver, but isn’t. We all watch as the vehicle is lowered into the sea, detached from the crane, and begins to dive while the deck crew pays enormous attention to the tether as it begins to unspool, and once the ROV slips under the surface, we all make our way to the control room. Pilots and Science crew piloting and sciencing. Photo by Rich Ross. The control room is filled with ceph-loving colleagues and we are looking at the screens like children looking at Christmas presents on Christmas Eve. What will we see? What we are looking for? A surprise? Something no one has ever seen before? Anything could happen at any time. This is the best of safari – the thrill of expectation. My wife says that you only need one cool sighting on any animal safari to make a terrible trip into the best trip ever, and on this trip we don’t have to wait long. Today we are only diving to 400 meters (1300 feet) as opposed to the 1200 meters (3900 feet) on my last trip, and the ROV gets to the site quickly. Within a few minutes we see our first Flapjack octopus. This is a ‘gelatinous’ octopus that not enough is known about, but man is it cool: soft bodied, orangish/pinkish skin, two ear like fins on its mantle, webbing between its single row of besuckered arms, and huge eyes which make it look like an Anime character that just wants to be loved. 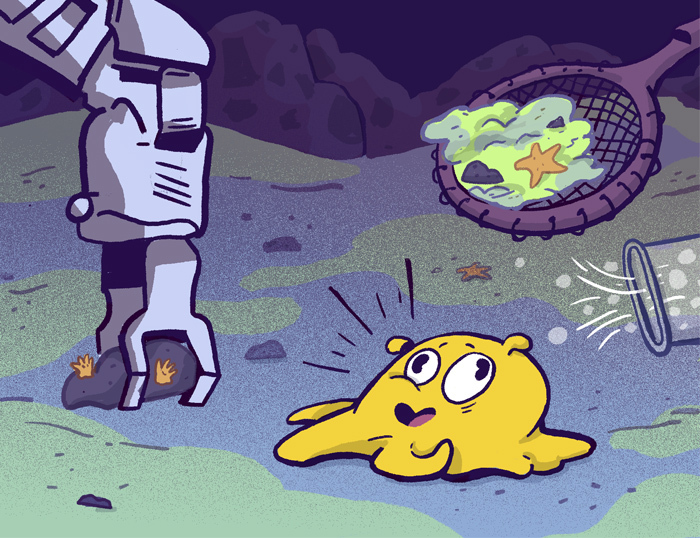 Flapjack octos move slowly on the substrate, sometimes wriggling into the muck presumably to feed, and sometimes they leave the bottom, pushing themselves through the water by opening and closing like an adorable umbrella (I like to think they are de-evolving into Jellies). Some people think they are a ‘dumbo octopus’ (Grimpoteuthis spp.) like Pearl in Pixar’s Finding Dory, but while similar, they aren’t the same. The ‘spatula’ collecting mud and rock and associated fauna. Photo by Rich Ross. It is decided to use the ‘spatula’ to move the octopus into the water column and to snag it with static tubes. Often, you only get one chance to pull this off because the bottom is made up of fine silt, and once disturbed by the ‘spatula’ or the propellers of the ROV itself, the water can become as transparent as pea soup. 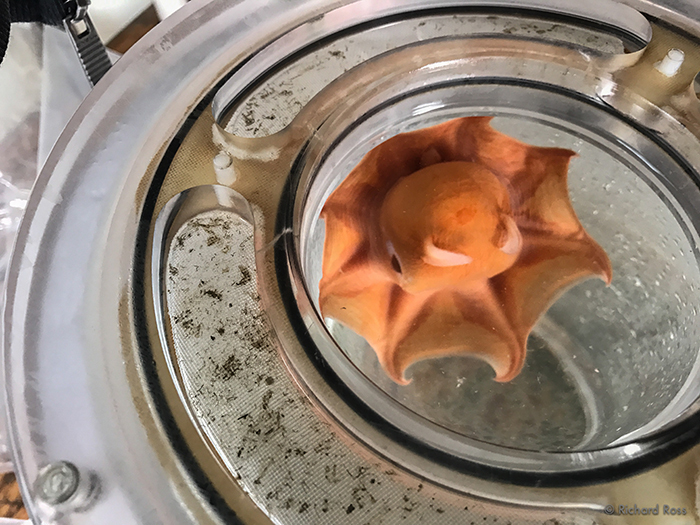 The octopus goes up into the water column, but the first pass at collection is a miss, and the bottom gets disturbed during the repositioning of the ROV and we lose track of the octo. We all feel a strange mixture of happy/sad. Sad we missed the catch, but happy that we saw an octopus so early in the day. With expectations high, we move along, looking for more animals. “Well, there goes the neighborhood…” Illustration by J.R. Zuckerberg. It isn’t long before we find another Flapjack, flapjacking along the bottom. This time we decide to use the suction hose for collection. We see the animal go into the tube without a hitch and begin its journey to the holding container. We all swivel our heads to another screen, the screen that shows the collection container, and wait, and wait, and wait… until the octopus come into view in perfect condition, and the entire room erupts into applause as the container is closed and rotated to put another container in place ready for the next specimen. A good start to a good day that only gets better. We collect enough octopuses both for display and research at MBA, as well as for research at MBARI. At least one of the octopuses will go immediately on display in the specialized deep water tank in the amazing “Tentacles” Exhibition at the aquarium (if you haven’t seen it, and like cephalopods, you gotta get there, it is truly excellent and I am incredibly proud to have contributed to it in some small way). Having collected enough octos means two things – we can spend some time getting some close up video of some octos we aren’t going to collect, and we can spend time collecting some other stuff. 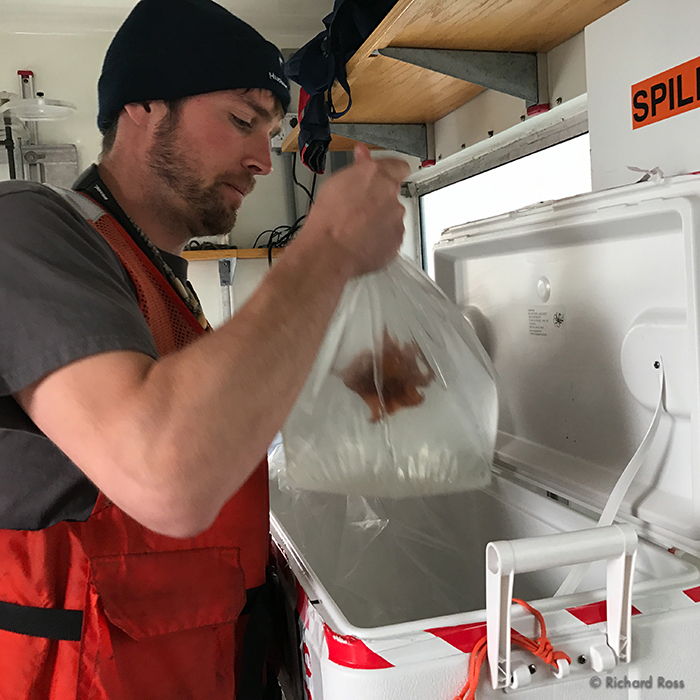 MBA senior aquarist Bret Grasse puts the newly collected Flapjack octopus into a ice chest for transport from MBARI to MBA. Photo by Rich Ross. Rocks are something that is on the collection agenda because they might help aquarists understand what the Flapjacks eat. At this site, rocks are hard to find in the silt. Sonar give us some clues, but most turn out to be shells. We able to get a few rocks and some mud as well, collect a dragon fish for potential display, and then the ROV is moved into the water column for some mid water jelly collection. Outside of the control room there are screens spread around the other areas of the ship so that people can see what is going on without having to be in the control room. Even though the view is the same, I like to be in the control room soaking it all in, trying to pick up the pilots lingo, and somehow feeling like being in that room makes me closer to the actual action going on 400 meters below us. This trip is so productive, that I actually pull myself out of the control room and make a peanut butter and pickle sandwich, which makes no one feel sick. I eat half of it as several of us sit around the galley table smiling at each other, chew, and watch the screens. 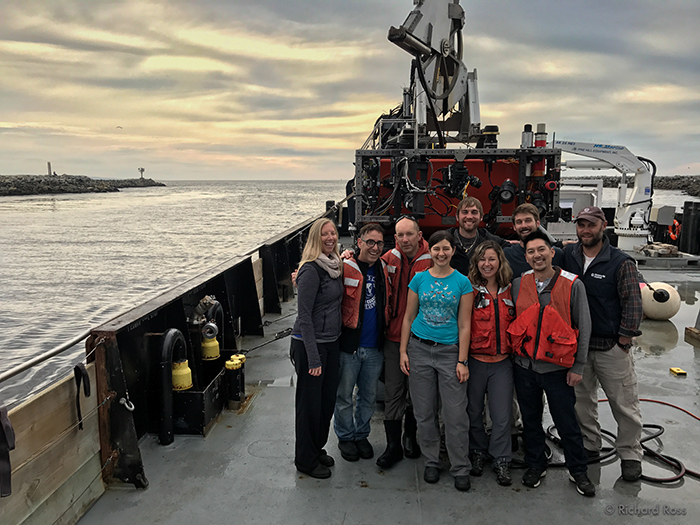 Last Thursday, MBARI Postdoctoral Fellow Stephanie Bush and her team from the Monterey Bay Aquarium went to sea aboard the R/V Rachel Carson in Monterey Bay. They were on a mission to collect octopuses in the genus Opisthoteuthis to be used for species description and display at the aquarium. Some HD video up view of a Flapjack octopus doing its thing. Video courtesy of MBARI. 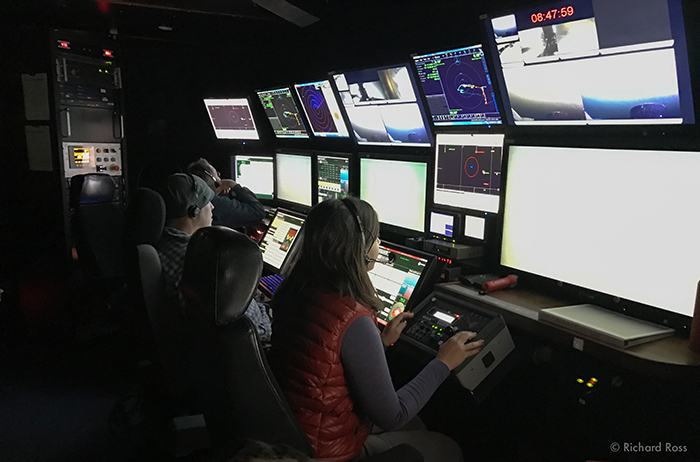 As the ROV Ventana ascends, we put on life vests and venture out onto the deck to get ready to help with the processing of the specimens. The deck crew removes floats from the tether as it is reel in, and use a mallet to make sure the tether goes back onto its spool tightly so it isn’t damaged. The ROV is lifted out of the sea and placed gently onto the deck, and as we remove the containers holding animals, the pilots start their post dive checklist. We bring the animals into the wet lab on deck and begin bagging them up for transport back to the aquarium. I reverently hold in my hand a container full of Flapjack octopus. It’s the kind of thing 14 year old me dreamed of, but never actually imagined would be a reality. Yet here it is. In my hands. Now I am transferring it to a shipping bag. Now I am sealing it up. Now we take a few precious seconds to take a selfie with the bag because we are all so excited and nerdy, and then quickly the bags go into ice chests to keep the animals dark and cold. This done, we gather for a group photo with the ROV Ventana as the ship docks. The days crew. Photo by Rich Ross. Unloading moves very quickly, as it is important to get the animals where they are going as quickly as possible. We do our part, and say our hurried goodbyes as our hosts and colleagues load up, and head out to their facilities to acclimate the days collection to their new homes. The two of us from Steinhart Aquarium left alone near the dock, aglow from the day’s events and the sunset. As we pull out of Moss Landing for the 2-hour drive home, I take out the remaining half of my peanut butter and pickle sandwich, take a bite, and grin. For more information on MBARI check out their Facebook page or Twitter.